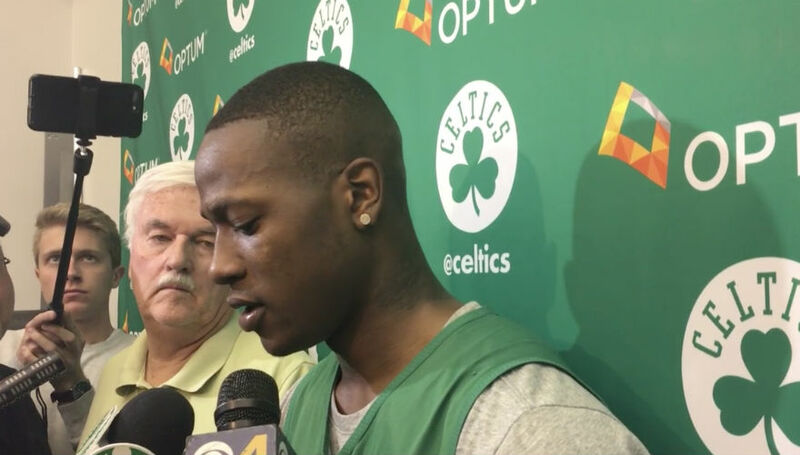 BOSTON — Boston guard Terry Rozier says he’s totally fine with people viewing the Celtics as the underdogs against the Cleveland Cavaliers in their Eastern Conference Finals series. “We’d rather [everyone] count us out,” he said when asked about Celtics being the underdogs. Rozier, who was instrumental in helping the Celtics brush aside the Philadelphia 76ers 4-1 in their Eastern Conference semi-final series, is averaging 18.2 points, 5.8 assists and 5.5 rebounds per game in the postseason this term. Meanwhile, fellow guard Jaylen Brown has revealed that he’s “I’m super excited” about taking on LeBron and the Cavaliers in the conference finals. “What more could you ask for? Twenty-one years old, back-to-back Eastern Conference finals, playing against one of the best players of all time,” he told reporters. Game 1 of the Eastern Conference finals is on Sunday at the TD Garden in Boston, MA, and it will be live on ABC and streaming on WatchESPN, starting at 3:30 pm ET.